The old port is in the eastern side of the Marina in the south coast of the bay: it is constituted from a long dock where they berth big yachts, and from a long floating wharf. The port is equipped of most complete and modern tourist infrastructures, and it is attended from international customers. Most larger cruise ships tender their passengers ashore. Porto Cervo is right in the center of the Costa Smeralda, for lovers of fine living, cosmopolitan tourism and the company of the elite, with their sensational yachts and breathtaking villas, which look out onto inspiring ports and natural bays. The Costa Smeralda is the Queen of all Mediterranean sea-side resorts and Porto Cervo is its capital. The Costa Smeralda lies on the North-Eastern coast of the isle of Sardinia, which is one of the main Italian islands, right in the middle of the Mediterranean Sea, just one or two hour's flight from the main European cities. It is an ideal sea-side resort, world renowned for its unique natural beauty and for the impeccably refined development, carried out by His Highness the Aga Khan, in perfect harmony with the natural environment. Nowhere in the world has such a large resort, of over 3000 hectares, been so well developed by only one person, with an overall Master Plan, contemplating a 50 year development and has received so much loving care for detail. The result is there to be seen: beautiful buildings on a human scale, designed by Europe's very best architects, hand built by top Sardinian craftsmen, with their millennial experience in the working of granite, the natural stone of the island and the perfumed juniper wood. On the Costa Smeralda you will find the most spectacular villas and apartments, designed by the world's most famous architects and built by Sardinia's finest craftsmen. All properties are protected by the efficient organization of the Consortium Costa Smeralda, that guarantees all basic services and infrastructure, water supply, road repairs, beach cleaning, road cleaning, medical services, fire protection, security, etc., which in turn guarantee a perfect, care-free holiday in the resort, as well as the stability of the investment. 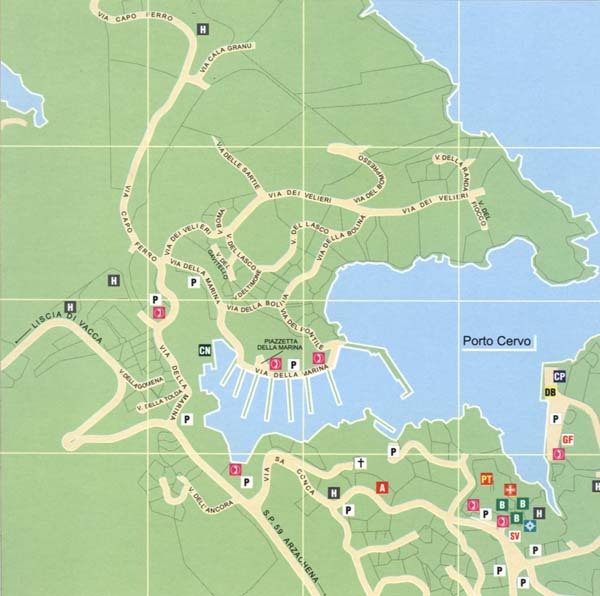 Porto Cervo is not a town rich in history or architecture. It is purely a luxury resort made up of a harbor and marinas; the town is dotted with colorful holiday villas and is nestled in the hilly terrain. The Yacht Club Costa Smeralda is one of the major contributors to the town's success as it attracts a lot of visitors for sport and leisure. The annual Maxi Yacht Rolex Cup, held in September, attracts sailboats from all over the world for week-long competitions and events. The best of the beaches are Liscia Ruia, Cappriccioli and Romazzino. There is no public transportation in the port. Taxis are general available. Europcar has a car rental office in the port. The surroundings are full of ruins of the Neolithic age, with important nuragic complexes, such as Cabu Abbas and the Holy Well of Sa Testa. At the center of Porto Cervo, it is possible to enjoy a walk down the mythical promenade and find oneself by chance shopping alongside film stars, TV and sports personalities. From the piazzetta delle Chiacchiere as far as the Sottopiazza, the town is a collection of narrow streets, windows and little balconies built in the style of the Costa Smeralda, along with a number of shops selling articles of the most prestigious brand names. Language: Sardu (Sardinian) and Italian.